Hand-made traditional (and non-traditional) Violin-family instruments for sale; Violins, Violas, Cellos, and five-string fiddles. 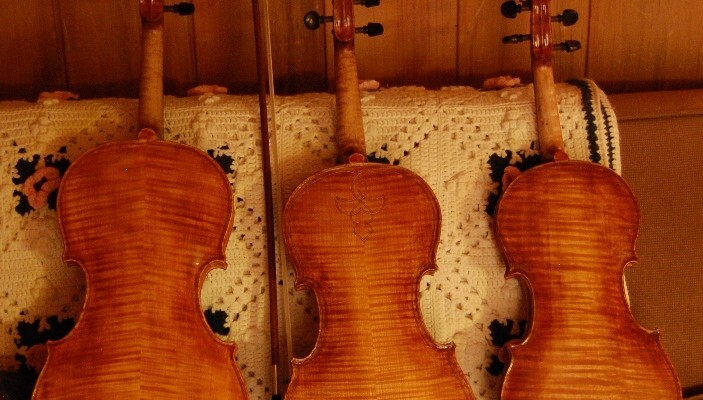 Remember that Amati, Stradivari and Guarneri once made new instruments. If a modern instrument is a good, luthier-made instrument when new, and is carefully maintained, its value goes up, not down: it is a good investment. This is especially true for a relatively unknown luthier-- as the maker's reputation increases, so does the value of his/her instruments. The same is less true for factory-made instruments, as no single luthier built them. My instruments are currently at very competitive prices--in fact, I am one of the lowest-priced American makers of hand-made instruments in the country. But my instruments receive good reviews from all who play them. As my instruments become popular and my name is no longer unknown, my prices will also increase. The value of my early instruments will increase to reflect the new prices as well. For this reason, I always offer 100% trade-in for undamaged instruments bought from me, when trading up to a more expensive instrument. All my instruments are numbered, dated, and signed. I supply a photographic and detailied provenance document with each of my instruments. I do make 5-string bluegrass fiddles, and the set-up is different for a fiddler, as a rule, than for a classical player. Fine instruments can be made of a variety of woods. 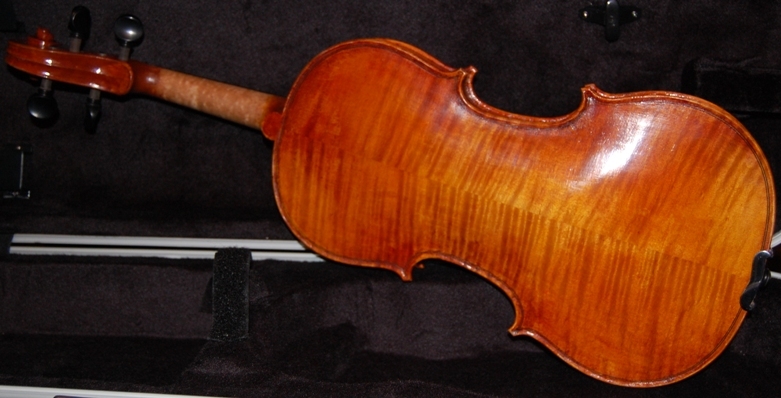 Stradivari occasionally used willow or poplar, though the majority were maple. 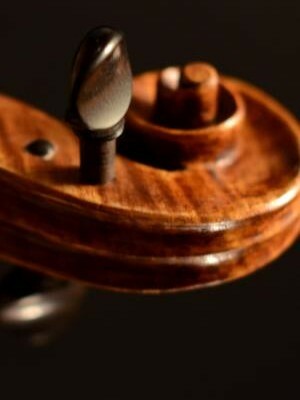 There have been some very good violins made from Big Leaf maple, but the European maple seems to hold the lead in terms of tone for violins, specifically. Violas, celli and basses, however, evidently because they are larger and tuned to lower pitch, work just fine with domestic maples. Of the domestic Maples, Red maple seems to be closest to the qualities of the European maple. Red maple is native to Michigan and other places in the eastern US and Canada. There is a ready supply of very fine domestic (Big leaf) maple and (Sitka and Englemann) spruce here in Oregon. I have enough domestic wood stockpiled to last for years. European wood is available, but I do not stock much of it...I purchase it as needed. I have done nearly every kind of repair imaginable, from simple, routine adjustments, to open seams, to cracks and missing wood, including neck-grafts and breast-patches. Some repairs I can make literally invisible, others I can only make a sound, strong repair, in a workmanlike manner. 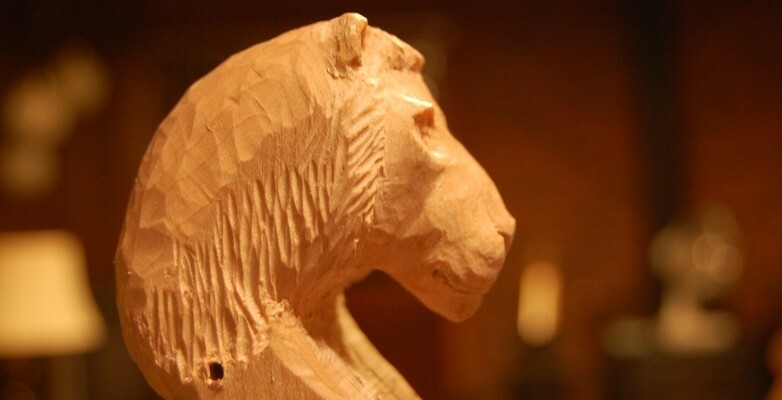 There are restorers out there who can literally make all repairs invisible. They specialize in restoration of very expensive instruments. If you have that sort of instrument, I may refer you to those restorers...it will cost much more, but I want you to protect your investment. I recently brought in my family heirloom Violin to Mr. Bishop. The violin was in terrible shape as it had sat in my grandmother's closet for nearly 70 years. 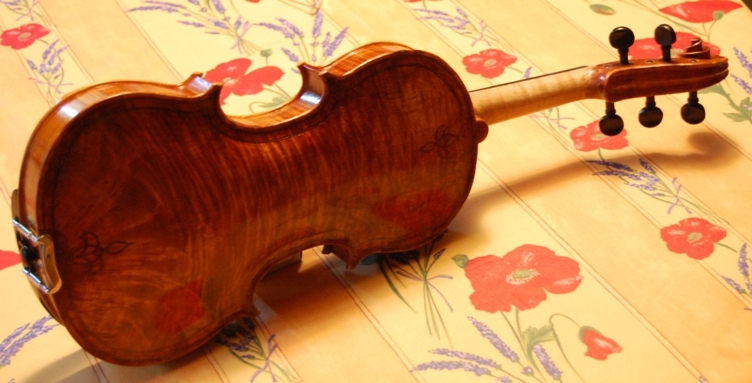 There was a large crack on the top of the violin and many seams on the top had become delaminated. The tuning pegs were no good and the bow had lost all curvature and most of the dressings. There were also many other unforeseen issues from previous repairs on the interior of the violin. I initially contacted Mr. Bishop because I could tell that he is very passionate about these instruments, and his original builds are absolutely beautiful. He quoted me a very reasonable price for the amount of repairs this instrument needed, he gave me a very realistic time frame and completed the repairs right on time. Not only did he finish the repairs on time, we were right on budget with his original quote. Now my poor old family heirloom looks amazing and plays much like I imagine it did for my grandmother. I can never thank him enough for the quality of effort he put into this instrument, and for the quality of the finished product. Thankfully my family heirloom can now continue to be passed down, and I'm sure my grandmother will be absolutely ecstatic when I bring this up to show her how it now looks. I highly recommend anyone that is looking for a new instrument, or just looking for repairs on their current instrument to contact Mr. Bishop first. You will not be disappointed in any way. Eternally grateful, Lucas Cunningham.